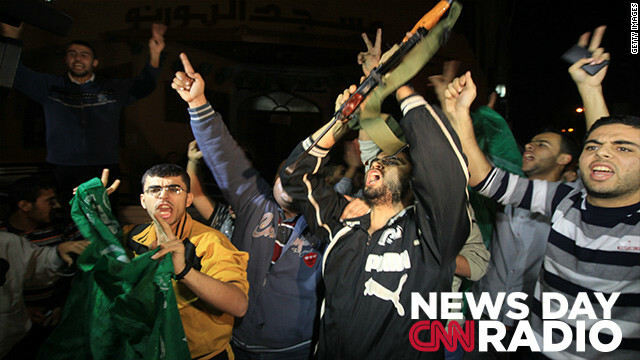 Palestinians shout and flash the V-sign for victory as they celebrate the beginning of the truce with Israel in Gaza City on November 21, 2012. There is now a cease fire in effect between Israel and Hamas ending the latest conflict which lasted 8 days. Israeli Prime Minister Benjamin Netanyahu told his country that he got assurances the U.S. would help stop weapons smuggling into Gaza through Egypt. Hamas leader Khaled Meshall said the conflict gained Hamas the backing of Egypt and the promise to start talks to end the Gaza blockade. U.S. Secretary of State Hillary Clinton thanked Egypt's President Mohammed Morsy. "In the days ahead the United States will work with partners across the region to improve conditions for the people of Gaza, and provide security for the people of Israel", Clinton said. When Ambassador Chris Stevens died in Libya, Tarek El Messidi decided to put out a call for letters of condolence from his organization, Celebrate Mercy. He started the group to help foster understanding about Islam and the Prophet Mohamed. He received over 7,000 letters from 115 different nations, which he presented to Ambassador Stevens' family. "I think I was very worried and a lot of Muslims were very worried that they would attribute his death to the teaching of Islam." Can an unmanageable situation be mismanaged? That's a question the Red Cross is facing in the wake of Hurricane Sandy. Victims of the storm surge placed high expectations on what the non-profit would do for them. In some hard hit areas even two weeks after the storm, those expectations were not met. "The Red Cross it doesn't come down to this side so much", says one resident of the Rockaways in New York.